Wednesday night, I went for a run. Last week I couldn't say no to the constant drizzle and went out for a two minute run behind my house, just to remember the feeling. Literally two minutes in the drizzle and it was the happiest I've been after a workout in weeks. Those two minutes were like a gateway drug! After that, I just kept thinking about when I could try again. 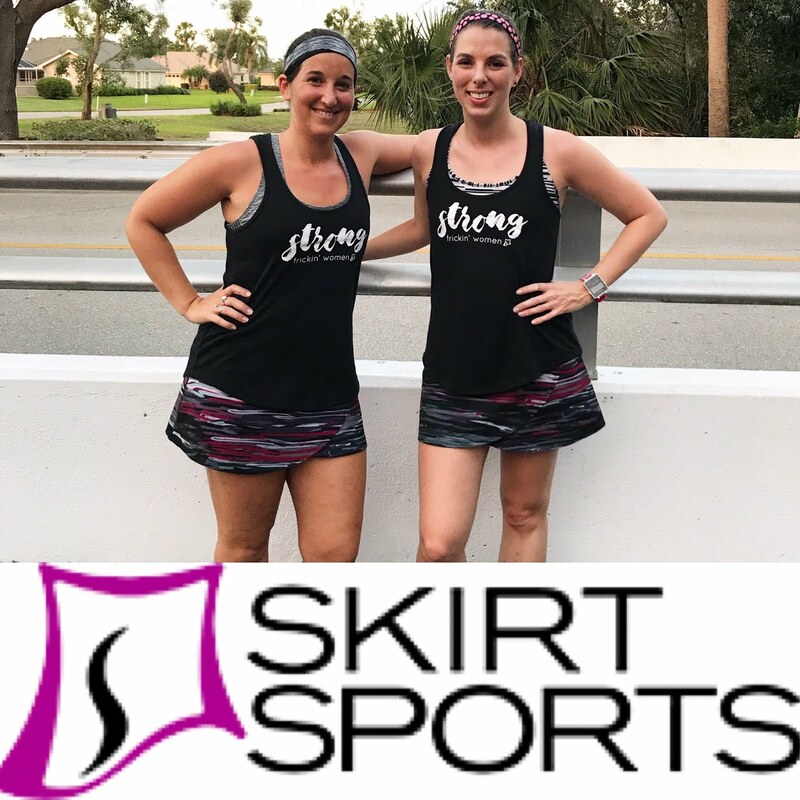 My plan for my legs is to work running back into my schedule and if/when the pain comes back, make sure I have a doctor at the ready to do the necessary tests. So, Wednesday. In summer, after tourist season, the golf course closes a little earlier and the later sunsets mean it's still nice and bright when the course is empty. That means I can run on it more often. After Elizabeth's and my arm workout Wednesday, I didn't feel I'd done enough, so I let my feet lead me outside. I set my watch to 4::45 intervals. I put on some music but left my headphones off. And then I just...ran. In that first four minutes, I saw a little family playing on the green. A girl, maybe four years old, her toddler brother, and her dad. She caught sight of me and started running full-tilt toward the path I was on. She was smiling and waving exuberantly. She stopped at the edge of the rough and my path, out of my way, and kept waving at me. I waved back, grinning. "I am exercising!" I agreed, and my heart was pumping: joy joy joy. "That's what you do," she called after me as I ran past. Heck yeah, kid! This IS what I do! It was like she had seen into my soul! The run was perfect. 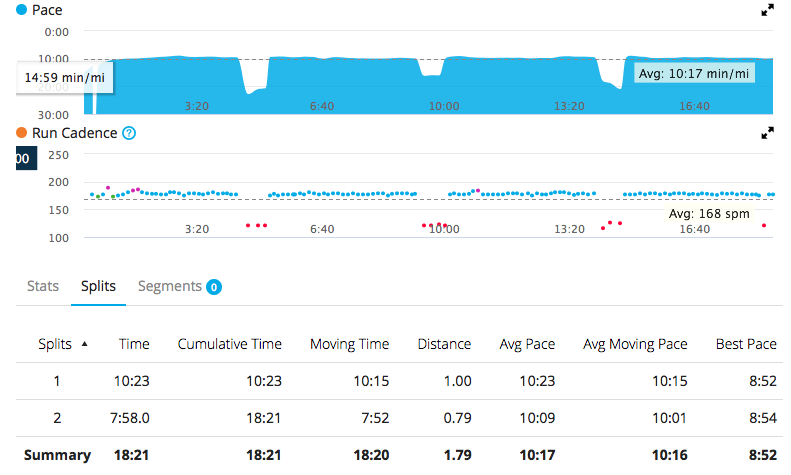 My paces were in the mid-9s early in my 4-minute intervals, edging into the 9:50s as the time ticked by, and the walk breaks were just the right length. I didn't quite complete two miles because I set a route and chose to stick with it so I wouldn't overdo it. But I couldn't have been happier. Intervals are new to me so I'm not sure how fast I'm supposed to walk, but I was happy and impressed with the overall effort I was able to put in! After the run, staring at myself in the mirror, I felt a sense of calm. This is who I am. I am home. I feel secure in this. I felt a satisfaction I hadn't felt in ages. 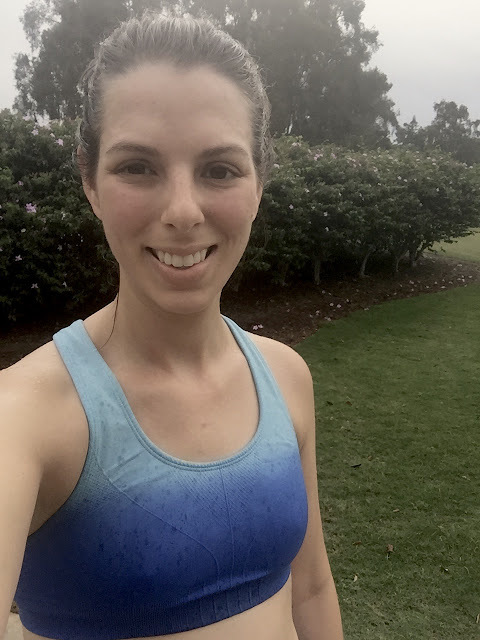 I looked at my reddened face and sweaty hair and was filled with a peace and sense of wellbeing I hadn't even realized I'd been without for these past couple runningless months. And I felt relief. I still love running. It hasn't forsaken me. It's still a part of me. I'm not naive enough to think everything is good and I'm cured and healed and whatever else...but I will take this little bit of progress and the joy it brought me, and I will bask in it. 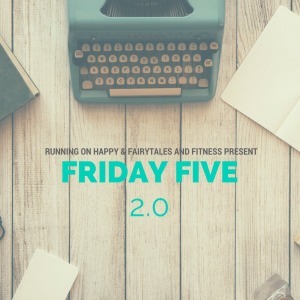 A while ago, Courteney wrote this post about fitness trends. 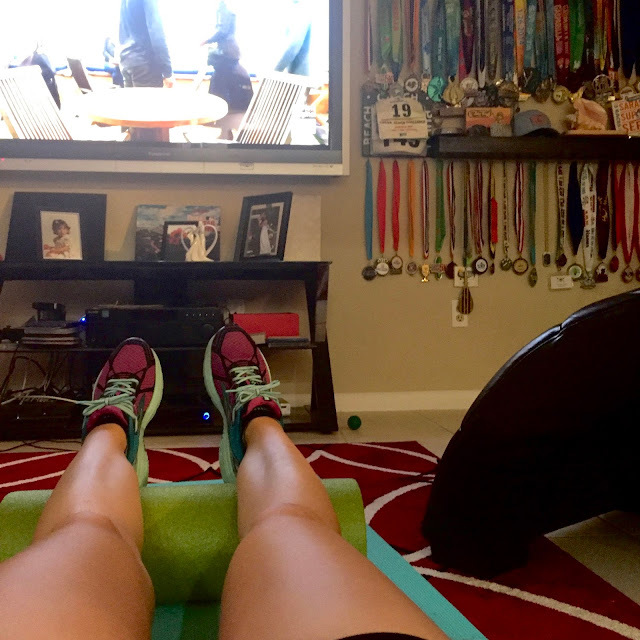 At the time, it got me thinking about why I've stuck with running for so long. I'd tried other routines and exercises to get in shape before, but running was the first one that stuck. Now, with my calf issues, the post has also gotten me thinking about why the advice of "look into another sport" has made me irrationally stubborn and angry. Unlike many running bloggers, I wasn't introduced to running at a young age; I didn't have the benefit of decades of experience that just makes it come naturally. I started running in graduate school with no idea that races even existed outside of high school and college. Before running, I tested the fitness waters. I tried classes. I saw a personal trainer. I tried spin, hot yoga, weight-lifting, pilates...Nothing stuck. I would get bored or I'd hate the workout, and then I'd stop going. It's hard enough to motivate myself to start a workout I love, let alone one I dread! And people might think that when you try something and you're not good at it, it's normal to hate it, but eventually the hate will dim and soon you'll be in a routine and you'll love it! I think that's true sometimes, but not always. Because even though running was (and still is) hard for me, something about it just automatically clicked. And despite doing circuits and other workouts for a solid year now with Elizabeth, I still don't love those the way I love running. In fact, I don't even really like them most of the time. TBH, the best part of non-running workouts are these two! I don't know if many people really just naturally love all kinds of exercise in general, but I'm sure those lucky people exist. But if you're someone like me who wants to get active but it kind of goes against your nature, the best way to find success is to find something you actually enjoy. I think that's the downfall of most people who try to get active and give up; they just haven't found what they love. You know that saying about finding a job you love means you never work a day in your life? I think the same goes for exercise. I don't like to work out, so I found a sport I love, and it feels like I don't have to work out a day in my life! Do you like all workouts, or are you picky? What is your favorite kind of exercise? This wasn't a great week because my calves were killing me and I felt mentally and emotionally distant all week. But I still managed to get some stuff done. Monday: Rest. I had my appointment at the vascular surgeon's office. After that whole ordeal, I didn't feel up to a workout. Tuesday: I still was feeling pretty shell-shocked and down. I did some planks and arms, but nothing major. Wednesday: Elizabeth and I did two Blogilates videos for arms, back, and abs. Thursday: Another rest day. My head was just not in it. 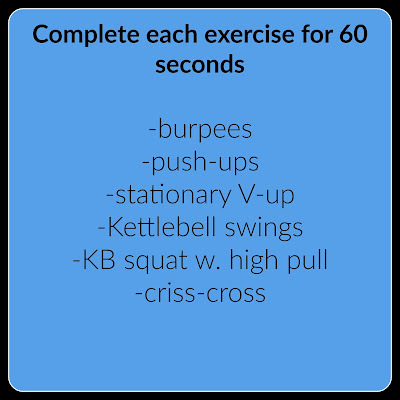 Friday: A tough ab circuit with the KBC. 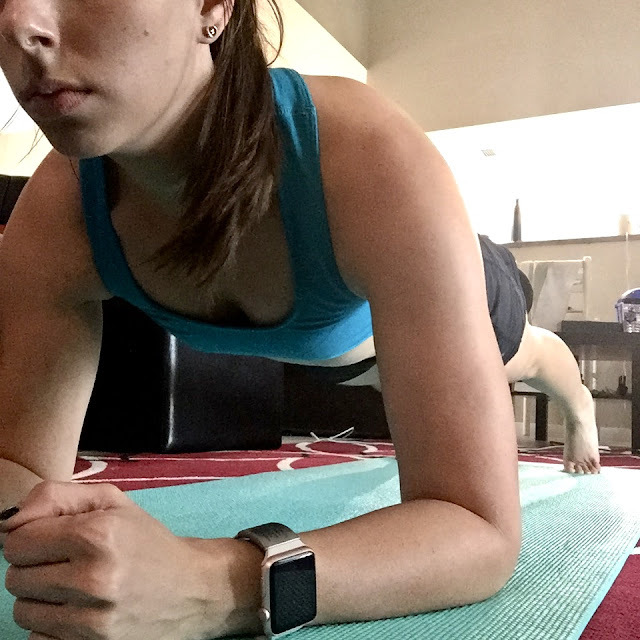 This was the first day I started to feel good again mentally, and the plank variations and movement helped loosen up my calves, finally. ...and then...well, it was raining all day and I just couldn't say no, so I went outside and ran for two or three minutes. This was completely on a whim, so I didn't time myself or anything like that. I just went out to the golf course and ran down a path I'm familiar with so I could kind of estimate distance. I just wanted to remember how it felt and remember how much I love it. My calves felt a tiny bit stiff by the time I stopped, but it felt good to be out there. (On that note, thank you all for your helpful and supportive comments on my last post. I have a list of doctors to contact this week so I can get working on getting a second opinion and a real diagnosis. A few of you commented that this doctor was taking the easy way out...he was happy to leave me without a real diagnosis or treatment, and that's really just silly. What kind of doctor does that?! Once I wrapped my head around the fact that his dismissive advice is pretty much useless to heed, I began to feel better. Sunday: 30 more minutes on the max trainer and some foam rolling. My view is very motivational. It helps me remember what I'm working for and that it will all be worth it! This was not a good day. I had my appointment at the vascular surgeon's for a pressure test on Monday, April 17. I met with the nurse practitioner because I wasn't able to get an appointment with the doctor until April 27. We went over my symptoms again. Then, a lab tech took my blood pressure in my arms, thighs, calves, ankles, and big toes. She used an ultrasound pen to double-check my BP in my thighs, calves, and ankles. Weird, to hear my heartbeat coming out of my feet. Then I did five minutes of calf raises to get that lovely burning sensation, and we tested everything again. Then, she did a full scan of both legs, from groin to ankle; she spent extra time behind my knees to rule out peripheral arterial disease (PAD). Then they brought me in to see the doctor. I'd been told he was too busy to see me, so knowing he was making time for me immediately brought a sense of dread. He broke the news. They'd ruled out PAD and other vascular issues, so barring bilateral tears (still a possibility but unlikely) it's probably compartment syndrome. That's unlikely too - a rare diagnosis. But less rare than bilateral calf tears. His suggestion was that I "find another exercise". That I "take up biking." "I am going to be running at 90," I told him and started crying. I felt stupid for crying, but I was so caught off-guard the emotions just kind of took over. When I had control, I asked some followup questions. What's the next step? What if I elect to have surgery, a fasciotomy, the only real "cure"? He recommended against it because of the risk of scarring, but agreed to help me seek a second opinion for testing and treatment. When the doctor stepped out again, the nurse practitioner took over. She was really nice, and explained that sometimes male doctors don't get it, that she could see running is my passion. I cried on the drive home. I wasn't sure why I was so upset; maybe because hearing "You should give up running" was the last thing I expected. Maybe because the doctor had treated me like a vain little girl who would care about surgical scars and because he clearly doesn't get that running is more than just my preferred means of exercise. When I came home I tried to look like everything was fine, but Matt took one look at me and asked, "What's wrong?" "They said I can never run again." I tried to make it a joke. But then I started crying. Again. And I explained against his chest that this wasn't really the case, that we have ruled out PAD and the doctor thinks I have compartment syndrome after all. That the cure is a fasciotomy resulting in horrendous scars or to take up another form of exercise. That the doctor highly recommended biking. That he said most of his female patients regret the surgery because the scars are so bad. I think that's what brought me to tears. That he would speak to me like that, telling me that "young women" don't like the scars. Like scars matter. I have scars. I embrace the history of my scars. Our bodies are made to be lived in and banged about. No one is scarless. I am not scared of scars. I can't give up running. Running saved my life. It changed who I am wholly and completely. And I still have goals to meet. A sub-5:00 full marathon. A 2:05 half. A sub-60 10k. A sub-26:00 5k. The Loch Ness Marathon. It seems silly; I'm a hobby runner. I'm not winning any races. I'm not an elite racer who makes a living off this. But I can't give up running...not without a fight. And not for fear of scars. I'm still in pain from the exercises on Monday. Once this dissipates, I'll try running a bit. Intervals. Then, if the pain comes back for real, I'll see if my insurance company will allow for an MRI now. 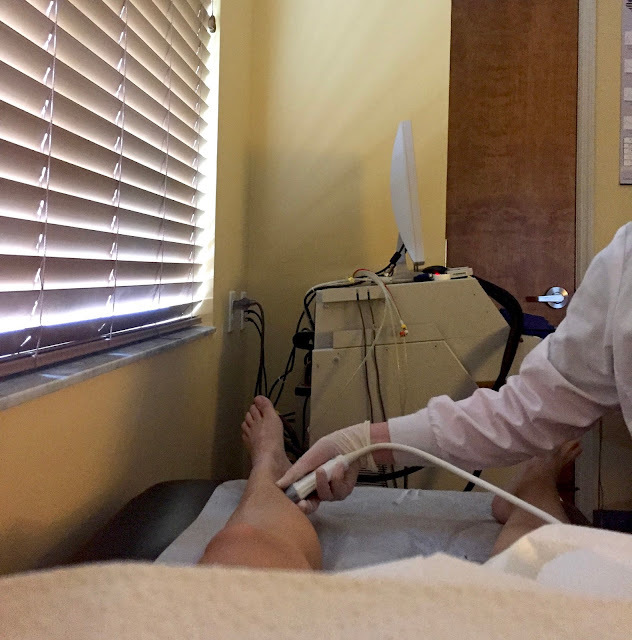 And I'll schedule an actual pressure test, complete with needles and pressure gauges, like my calves are some kind of a messed up basketballs. And if that test is positive and it really is compartment syndrome, I'll have the surgery over the summer. Five weeks of recovery time and then, hopefully, pain free runs and some storytelling scars for the rest of my life. Having a plan isn't making me feel any better because the lingering pain in my calves tells me running isn't going to work out right now. It's Friday, and my legs still hurt so much it takes me two minutes to stand up - slow, slow, careful - and I'm walking with ginger, timid steps. I was prepared to hear this was nothing; I was taking silly pictures of myself hooked up to the BP machine before the hammer dropped. I don't feel like I run enough to get a diagnosis like this. It's like the injury doesn't fit the athlete. And we don't know yet, for certain. So I should be trying to stay positive. But I feel like I'm grieving, and I'm pissed and frustrated. I don't feel happy to have an answer because I don't really have a real answer yet. Waiting is worse. Maybe, if this goes the way I'm imagining, I'll feel happy five weeks post-op when I can run without pain. And that will be August. I did talk to a Sub-30 Club friend about this; she had a bilateral fasciotomy for compartment syndrome years ago. She doesn't regret it. She can finally run without pain. Her scars are noticeable but far from terrifying. She made me feel much better about the option. It feels viable, knowing someone who had it done. But I just wish I weren't in a position to have to make the choice. Sorry this is long and maudlin and a little all-over the place. Obviously my head is full of things right now and this was the best way to try to wrap my mind around it all. 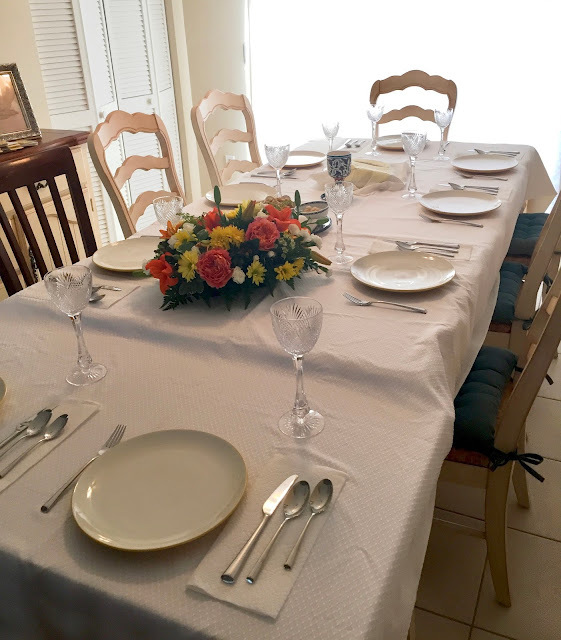 Even though Passover was last Monday, we had our Seder on Saturday. 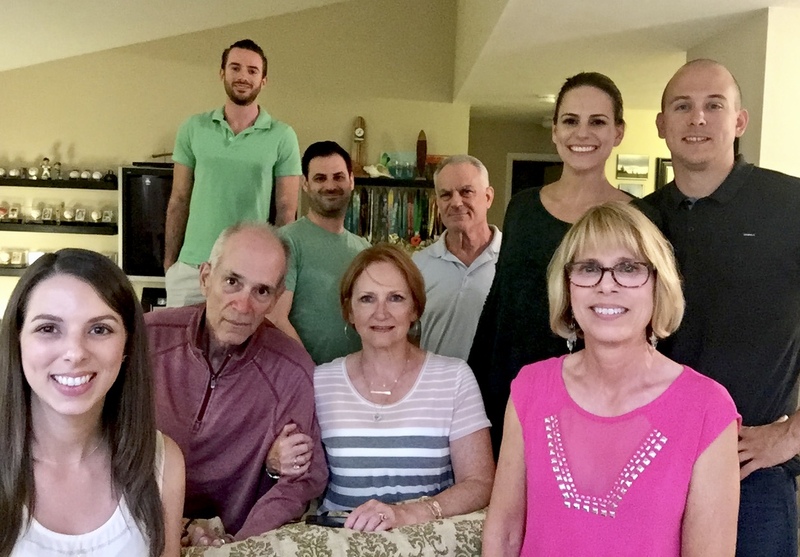 This year my aunt and uncle joined us, so we had a full house! It was really fun to host this year, as usual. Steph and Gordon came in Friday night. They made the matzah ball soup on Saturday morning and then went paddling with Matt while I kept an eye on the brisket. When I went to buy brisket this week, Publix was cleared out! The butcher told me some lady had come in earlier that day and bought seven. Who does that?! I was able to pick some up at another Publix nearby. I bought about 6.5lbs for the nine of us. -In a large baking pan, place baby carrots, diced potatoes (I prefer the mini red skin potatoes; I use about 10), and two small onions (chopped) in a single layer. -Put the brisket on top, fat cap up. -Mix 8oz tomato sauce with 1.5 or 2 cups beef broth and season with pepper, salt, garlic, and seasoning to taste (I like to use an Italian mix of seasoning). -Pour the mixture over the briskets. -Cover tightly with tin foil and place in an oven preheated to 300 degrees. Cook for ~5.5 hours, basting every two, and allow to rest for 30-60 minutes before eating. You know it's done when the brisket is super fork-tender...No knife necessary! While that cooked, I did a quick workout and then did my hair and makeup for the first time in months. Then I set the table. As usual, my grandparents sent us a beautiful flower arrangement for the centerpiece. We added a little plastic table to the end to make space for everyone! Our Seders are very casual and seem to get shorter every year. I use the Haggadah we've had my entire life, where my dad highlighted the portions we read and wrote notes in the margins. We skip a lot of it and just focus on the "important stuff": the story of Passover, the Seder plate, the plagues, and how the lessons of Passover are still relevant in fighting oppression today. Honestly, when you look at the state of the world today, I feel like Passover gets more and more significant every year. As usual, mom made her amazing charoset. 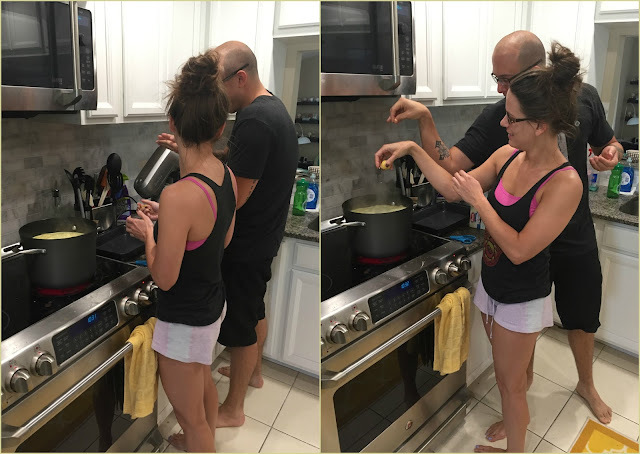 She also tried her hand at homemade horseradish, and it was singe-your-nose-hairs level spicy. For dessert, we had the usual flourless chocolate cake I make every year. It's super easy and always a crowd-pleaser. -Heat 1/2 cup water, 3/4 cup sugar, and 1/4 tsp salt, stirring until the sugar is dissolved. Set aside. -Melt 18oz bittersweet chocolate in a microwaveable bowl, then pour into a mixing bowl. -While mixing, chop 1 cup of butter into tablespoons and slowly add to the chocolate, one piece at a time. -Add the sugar-water-salt mixture, still stirring. -Finally, add 6 eggs, one at a time, to the mixture. -Pour the batter into the cake pan. Bake at 300 degrees for 45 minutes. It will still look soft in the center. Chill in the fridge overnight. The easiest way to de-pan the cake is to cut along the edges, then dip the bottom of the pan into hot water, invert the pan onto a plate and bang the bottom until you feel it loosen. It's so rich and fudgy, a thin slice is plenty, and it pairs very well with ice cream. This is my favorite holiday of the year! I love hosting, and each year I feel a little more confident in my cooking. I hope next year my cousins can come, too; then we'll have a full house and will need a second table! Happy Passover from all of us! It's been tough to find motivation to work out over spring break. I mean, I'm still getting it done, but I miss my workout buddies! 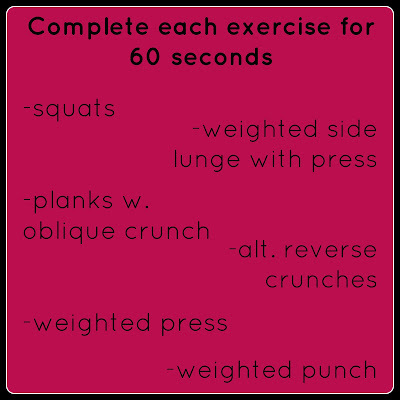 Monday: I put together a full-body circuit and completed it twice. 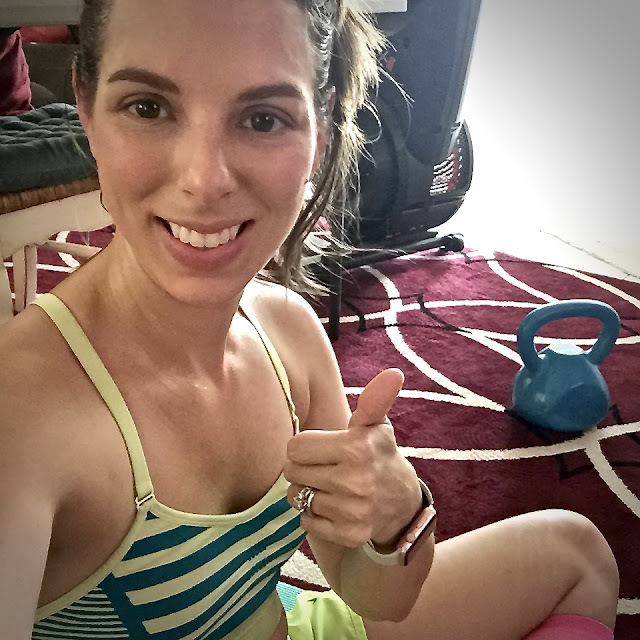 I probably should have done a third time but the burpees really got me! Tuesday: The pain in my calves has been completely dormant because I haven't been running, but Monday night I slept terribly because the pain was back. I used some topical pain relief cream and put on my compression socks, and a few hours later felt good to try a workout. 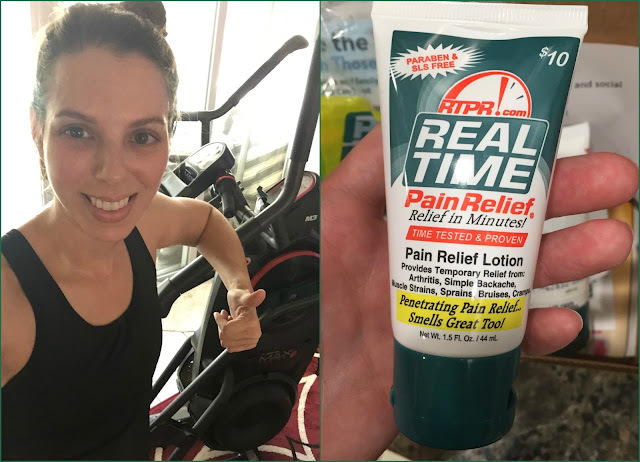 Real Time Pain Relief sent me a few samples of this stuff; it doesn't have as strong of a menthol smell as most topical pain relief creams, and worked just as well. It has a kind of floral scent; it's very nice, actually! 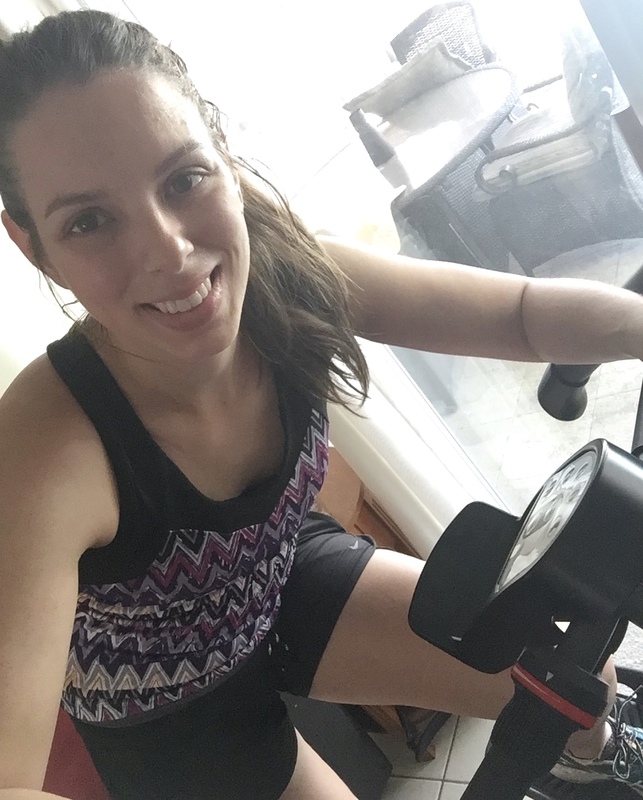 I did thirty minutes on the max trainer and felt pretty good. Wednesday: Rest. I got my haircut and didn't want to ruin the blowout with a workout haha! 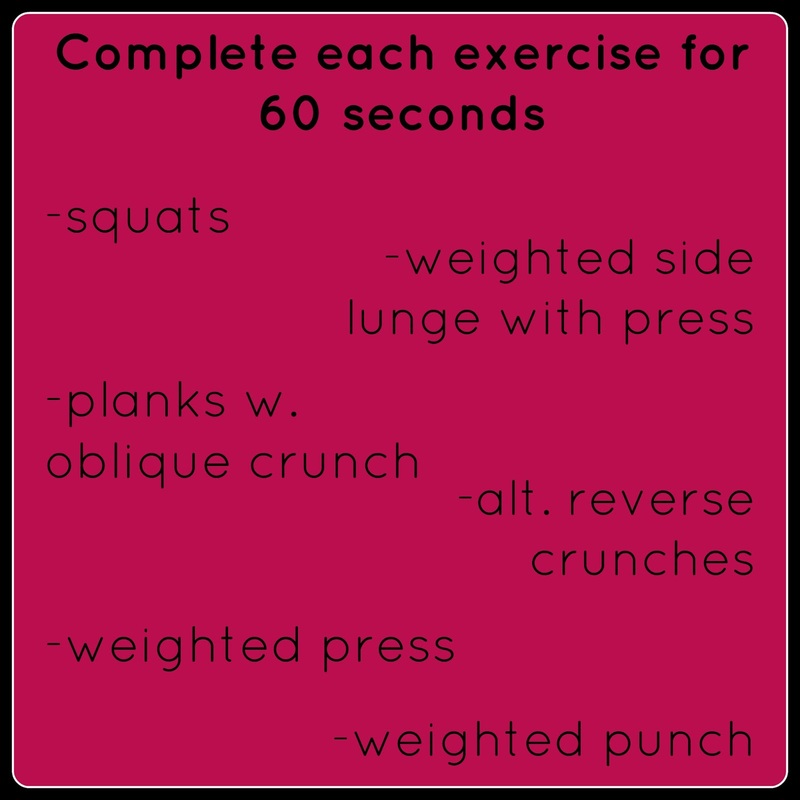 Thursday: 20 minutes on the max trainer followed by some planks and core stuff. I noticed my calves getting a bit stiff again on the machine, even though I was wearing compression socks. Friday: Rest. I did some more house cleaning/scrubbing/furniture moving for Passover preparation. Steph and Gordon came in that evening so I opted out of a workout in favor of hanging out with them. 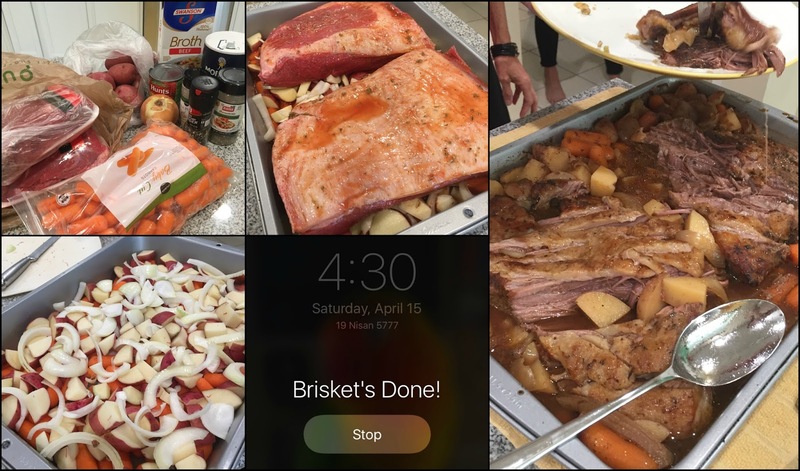 Saturday: I started cooking for Passover Seder around 10:30am and finished the last of the cleaning. 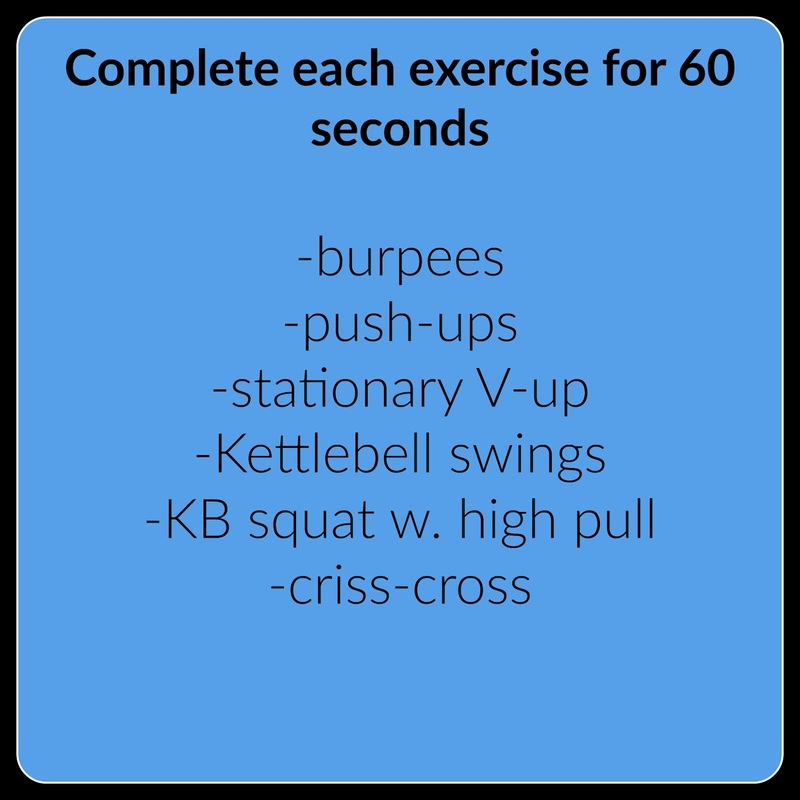 Then I did a quick little full-body workout. Sometimes you just gotta fit in what you can! 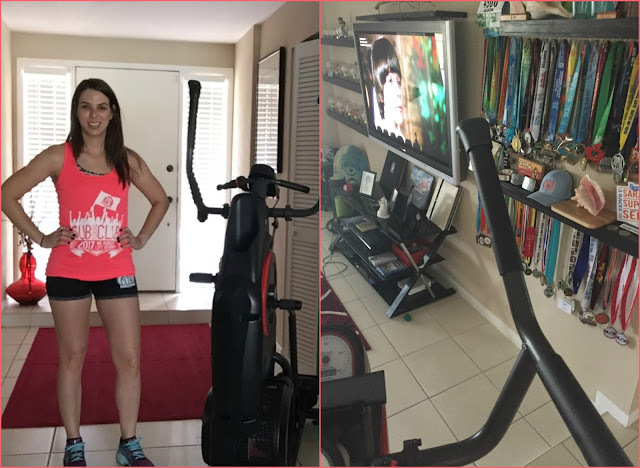 Sunday: I watched an episode of the Mystery Science Theater 3000 reboot, which is new to Netflix, while on the max trainer. I used to love this show, and it was hilarious and distracting while I did about 35 minutes of cardio. My view from the max trainer was very motivational! I finished with some stretching and planks. I wanted to do this post as a Friday Five, but there were too many songs. Then I figured, hey, this can be like a Friday Five x2...that counts right? Here are ten songs I am just totally feeling right now. Some of them give me some catharsis for the anger I'm feeling over my calves right now (my pressure test is scheduled for Monday the 17th so hopefully things will be resolved soonish) and some of them are just so pretty and poignant and catchy that I can't help but listen to them on repeat. K. Flay - Blood in the Cut. This song resonates with the part of me that craves punishment or physical violence when I'm angry. We all have that inside, I think, even if most of us don't act on it! Depeche Mode - Where's the Revolution. I had no idea DM was still making music, but I'm glad they are! I love this song. This one is so beautifully political and relevant. Portugal. The Man - Feel it Still. This song is so catchy, fun and reminiscent of the funky, psychedelic sounds of the 60s. Sylvan Esso - Radio. Another upbeat, catchy song, but this one is full of sharp, scathing lyrics directed at the music industry and capitalism in general. Sylvan Esso is quickly becoming one of my favorites! The National - Graceless. The National has been one of my favorite bands for a long time, and their latest is no exception. Their music sounds almost emotionless when you first hear it, but it's actually so beautiful and poignant. If you've never listened to them before, I also recommend "Don't Swallow the Cap" and "I Need My Girl". Highly Suspect - My Name is Human. This song brings me back to the days when I really liked Stone Sour, Brand New, Breaking Benjamin...You know, those bands we all kind of feel embarrassed about now. Still, there's always going to be a part of me that a little angry and fighty and loves music like this! Bastille - Good Grief. I love this song because of how it talks about grief and letting go of people as they leave our lives. Grief is hard, but there are beautiful moments in it, too. Bastille - Blame. First of all, this video is so, so weird. Bastille has the oddest videos ever, but they're really intriguing and fun to watch. Anyway, I love the sound and feel of this song, and the imagery in the lyrics is jarring and visceral. Love it. 1975 - Somebody Else. (Song starts at 3:00) Poignant and pretty, this is one of those songs that I don't feel really applies to my life these days but still connects with memories. Lumineers - Cleopatra. This song feels like a reminder to grab hold of life and the people who matter and enjoy them now, because we don't want to look back on our lives with regret. I was wasting some time this weekend reading an article about ridiculous arguments people have had and some of the topics made me laugh. (Sometimes I need to take a break from reading about politics and these silly listicles are the best distraction!) I wonder how many answers to these weird questions we'd all agree on! 1. What color is the bikini in the "Itsy-Bitsy, Teeny-Weeny Yellow Polka-Dot Bikini" song? I always pictured it yellow with black or white polka-dots...but now I'm not so sure! There really isn't a clear answer! 2. Is a hotdog a sandwich? I'm going to go with no because the bun is one continuous piece of bread... Matt just informed me that sub sandwiches have connected bread so now I have to change my answer. Hotdogs are a specific type of sandwich. 3. Is cereal soup? My first impression is that soup is hot, but gazpacho and some fancy soups are served cold, so...yes? 4. 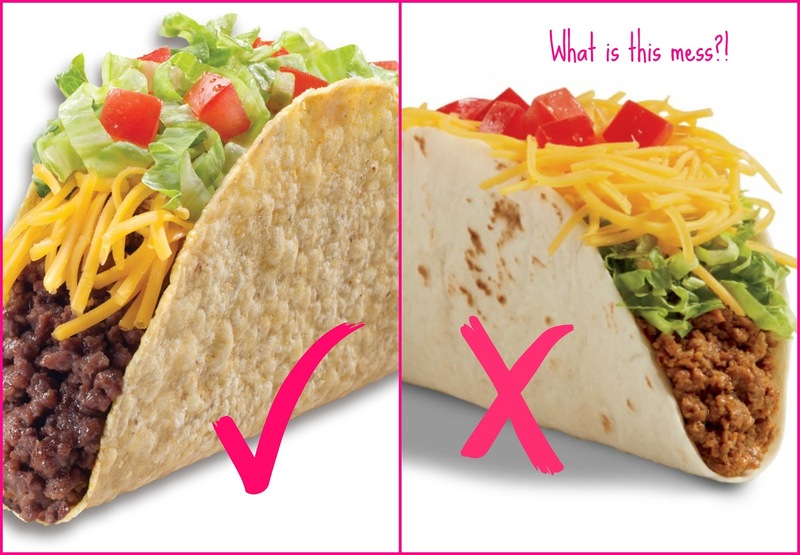 What goes first in a taco: cheese or meat? I used to put the meat in first but Matt taught me years ago to put the cheese in first to help hold the shell together! So now I can see either as being the right way to go! The only requirements with toppings-placement is that cheese has to touch the meat directly so it melts and sour cream has to go on top. 5. Are Die Hard, Home Alone, and Harry Potter Christmas movies? I didn't grow up celebrating Christmas so I could be wrong. However, because these movies are shown on TV during Christmastime, I'm going to go with yes. 6. Are sandals shoes? Yes. This one feels easy, as a Floridian; we wear sandals year-round. And I'm talking basic sandals, not strappy or open-toes heels. What do you northerners say? These probably take longer to get into and lace than sneakers. 7. Are Cheetos chips? No...they're some kind of crunchy non-chip snack food. 8. 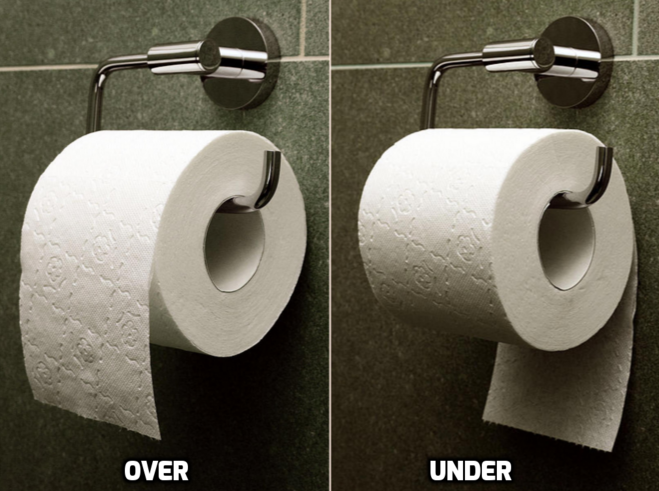 Does toilet paper go over or under? Over! I do not know how this is a question because everyone should have strong feelings about this and should get that TP unspools more easily when it goes over. True story: When using the bathroom away from home, if the TP goes under, I fix it. This might be an OCD thing, but really, I just feel like I'm doing the next bathroom-user a favor. 9. Are you naked if you remove all clothing except your socks? I admit, I thought about this longer than I should have and my answer is long and weird. 10. How deep can a pan be before it becomes a pot? 3 inches. Huh. I feel really sure about this one. Also, "sauce pan" is a misnomer as they are clearly actually pots. What are your thoughts on these deep and important questions? Monday: Maxtrainer (I finally learned that this is what my particular bowflex is called) for 30 minutes while watching Two Weeks Notice. One perk of Matt being out of town is that I don't feel bad about commandeering the TV and watching whatever I want! Tuesday: Maxtrainer (30 minutes) & planks. More crappy TV, this time in the form of Vanderpump Rules. Please tell me I'm not the only one who loves this junk. 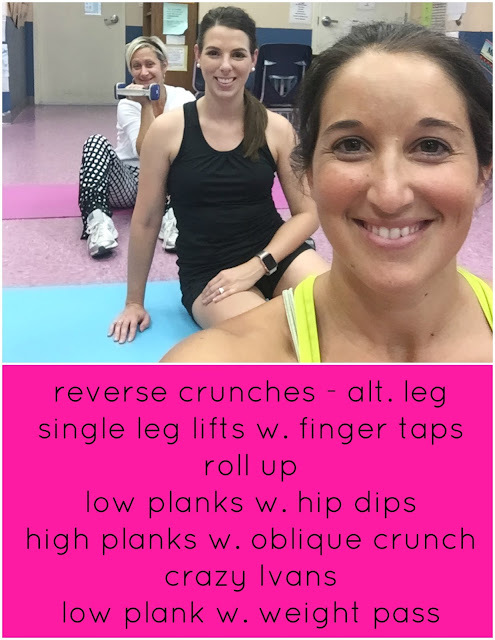 Thursday: Core (Blogilates Extreme Abs 1 & 2) and upper body weights. Elizabeth and I had an after school meeting again so we did two videos and then some random weights to pass the time between dismissal and the meeting. Friday: Maxtrainer (30 minutes). 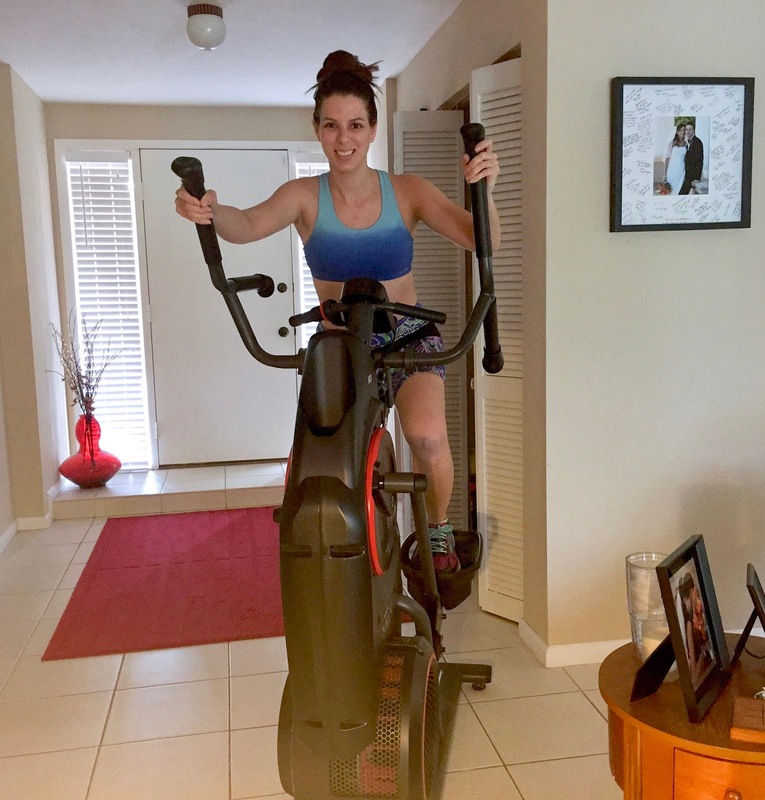 I have to say, this thing is super convenient and it was nice to get so much cardio in this week! Saturday: Rest/house cleaning. 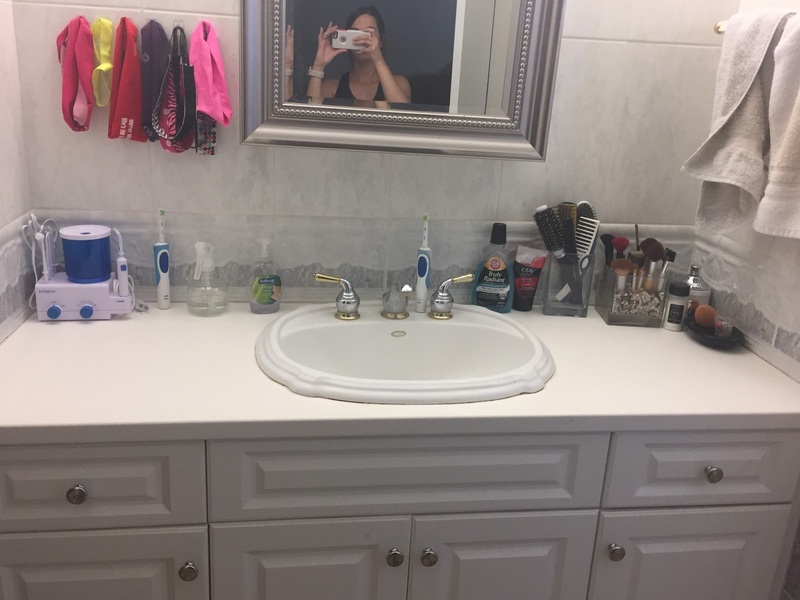 I scrubbed the bathroom and it was basically an upper body workout! Sunday: 20 minutes on the maxtrainer and then some upper body and core work. This was a pretty good week with four days of cardio, but I was definitely still moody about missing running. 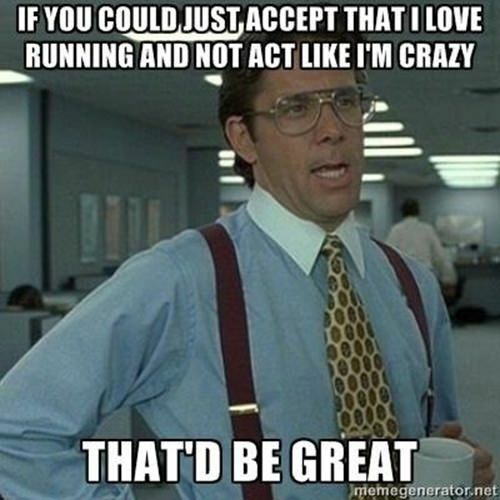 I am so tempted to try a little run sometime over break...Just to see how I feel. My pressure test is scheduled for this coming Monday the 17th, so hopefully answers will come soon after! Well, today is the last day of school before spring break. I made it! Break is super late this year for some reason, and when we get back we'll have five weeks left of school. One of those weeks is mostly our DC trip and one is mostly half days, so really, the year is basically over. I am in desperate need of this break. I am exhausted. My allergies have been pounding away at me. The sudden heat and humidity we've had this week has given be a constant headache that nothing seems to cure. A break is necessary. Today I'm linking up to bring you the five things I plan to do over break. 1. Sleep. This should come as no surprise; my teacher friends will get it. The end of Quarter 4 is mentally exhausting. I am going to catch up on sleep and also front-load for what I'm sure to miss as the year draws to a close. 2. Clean. 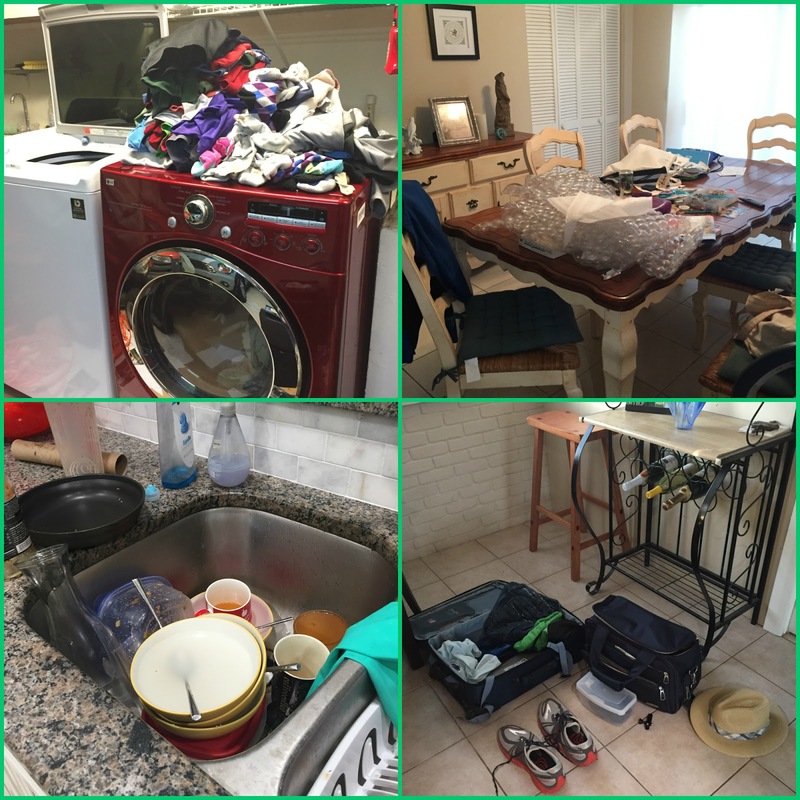 My house is a disaster! The last couple weeks I just haven't had the energy to clean and organize beyond "tidying up", and over break I plan to do a deep cleaning and finally get the hardware put on our kitchen cabinets. Clean clothes folded but not put away, a table full of jewelry-making supplies, two days' worth of dishes in the sink, and Matt's luggage from his recent trip to St. Croix...Please don't judge us. Or me. Mostly me. 3. Host Passover! We are actually having Passover late this year because of scheduling conflicts. One nice thing about being reform/non-religious Jews is that we make up our own rules sometimes. We'll have Passover April 15th and this year is the first time I'll have extended family attending! At least year's Passover. It will be nice to have more people this year! 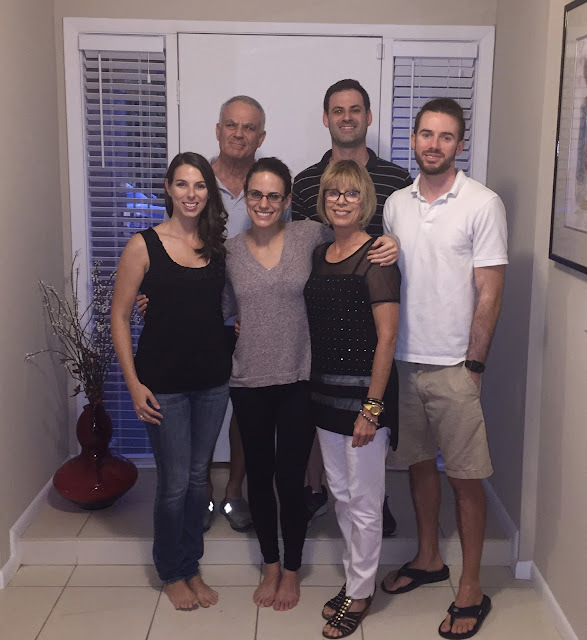 My Aunt Kathi and Uncle Bruce have finally moved to Florida, and they're coming to Passover. This will be the first time since we moved here in 1999 that we've had more than just our nuclear family at a holiday! 4. Shop. Matt rarely gets new clothes, and that's probably why his favorite shorts have holes in them, not to mention most of his socks. I recently donated a bunch of my clothes and bought new stuff for the first time in about six years, but over break it will be his turn to donate, toss, and replace. It takes a lot to convince Matt to buy new clothes, but this will do it. 5. Plan my next tattoo. I've been wanting another for awhile now, but the opportunity to get it hasn't come up. Now it's look like a possibility in the near future, so it's time to plan. I have a good idea of what I want, but I'm working out some details...such as color (or not) and placement. No pictures for this one...It's a surprise until things are finalized! How do you spend time on vacations? How often do you buy new clothes? 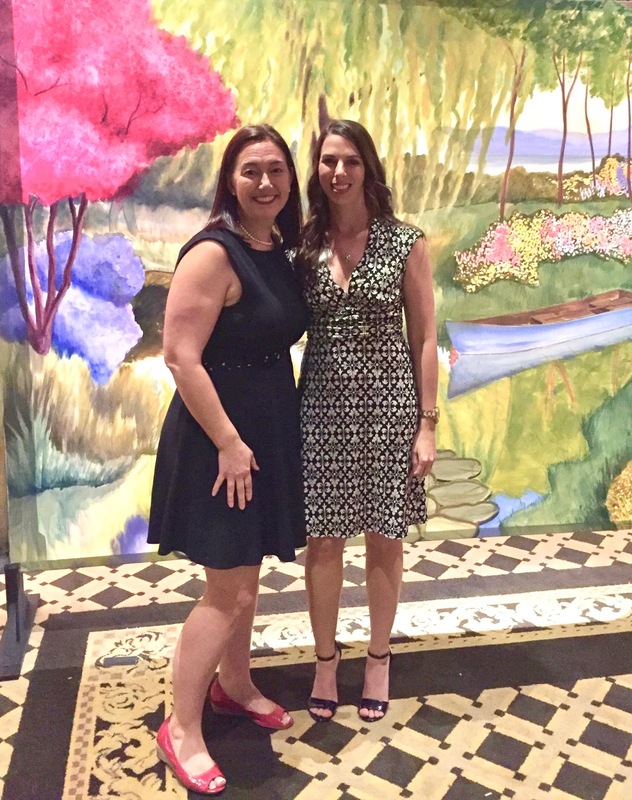 In early March, the executive director of our local Holocaust Museum, Amy Snyder, reached out to me to see if I'd be willing to speak at an event. She wanted me to speak on how my school's relationship with the museum has impacted our students over the last eight years. 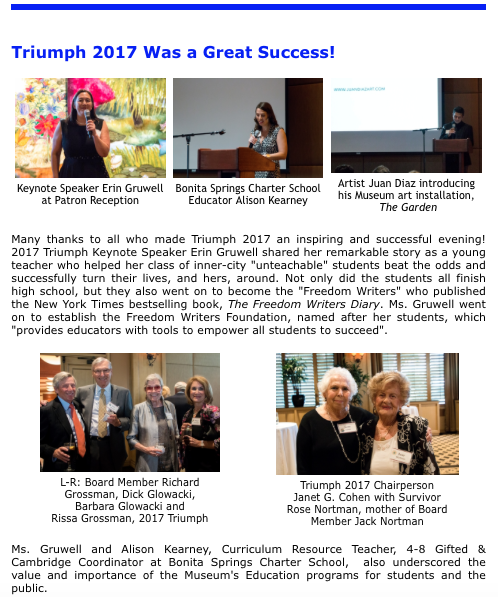 From the museum's April newsletter. Dinner was fantastic, but I was a little too nervous to really eat. I expected Amy to introduce me, but I was caught off-guard when she finished my introduction with: "If she looks familiar, that's because she was in People Magazine as an MLB All-Star Teacher in 2014!" Talk about setting me up. Anyway, my speech went well. I had practiced it carefully, but went off the cuff as was appropriate to thank Sabine, the survivor who spoke to our kids this year. 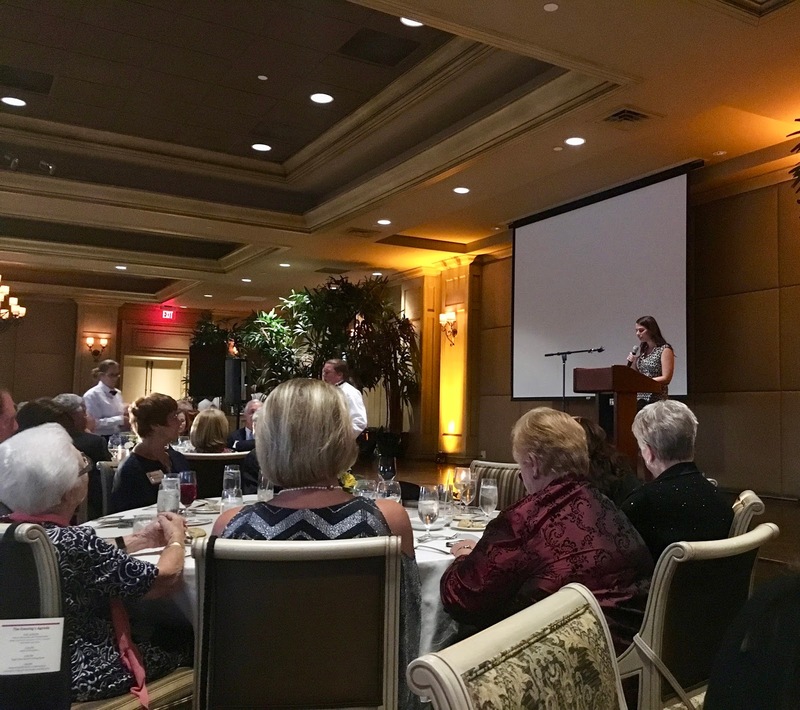 At the end of my speech, I spoke about Hannah, a student who was so changed by our Holocaust education program that she has sought out ways to get involved in humanitarian efforts and will be going to school with the goal of eventually working for the UN. She actually volunteers at the museum when she can, and she made it to the event. Matt got some blurry pictures. I'm hoping to get my hands on the professional photos soon. I promised her I wouldn't embarrass her, so I spoke about her but didn't point her out; but after I finished Amy took the mic and said, "And Hannah is here tonight! Hannah, raise your hand!" Throughout the rest of the night, people came up to her, asking if she was the "famous Hannah." It was fantastic to see her acknowledged; young people who work hard to change the world deserve praise. For someone just barely 18, she's already done so much and worked so hard to make a difference in the world. That's what teaching is all about. We all got copies of Freedom Writers and Erin signed them. Erin and me at the memorial garden painting. The most poignant moment for me was after my speech had ended. An elderly woman named Becky came up to me and thanked me for talking about Abe Price in my speech. Abe was a survivor who shared his story with my kids two or three years ago. We were the last school he ever spoke to; two weeks after, he passed away. Becky was a close friend of his; she said she remembered how Abe was different after speaking at our school, intimating that he knew it would be his last. My kids worked together to attend his funeral. She told me how moved she was that they had done that, and that she appreciated my honoring his memory in my speech. 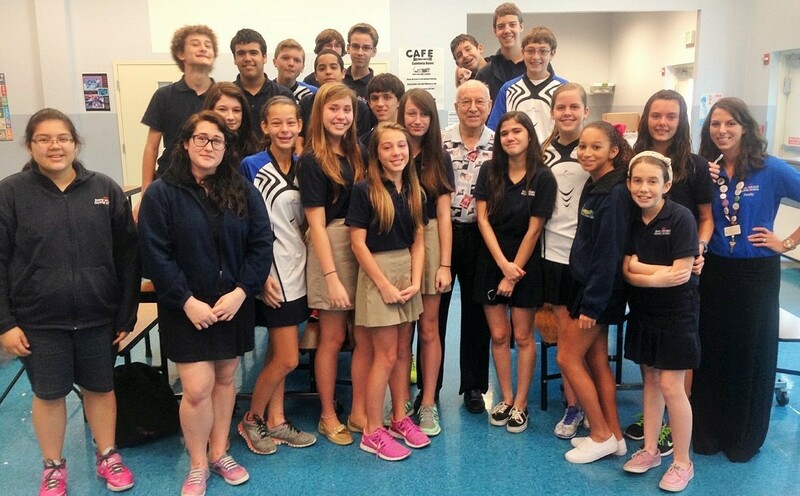 My students with Abe Price. You can read his story here. Let me just say, there were a lot of tears that evening. Erin's presentation was outstanding. She showed clips of the Freedom Writers film and the actual film of her students going to Auschwitz with her. In a time when we're seeing a rise in hate crimes, Holocaust education has never been more important, and it reaches students on all levels and in more ways than we can articulate. 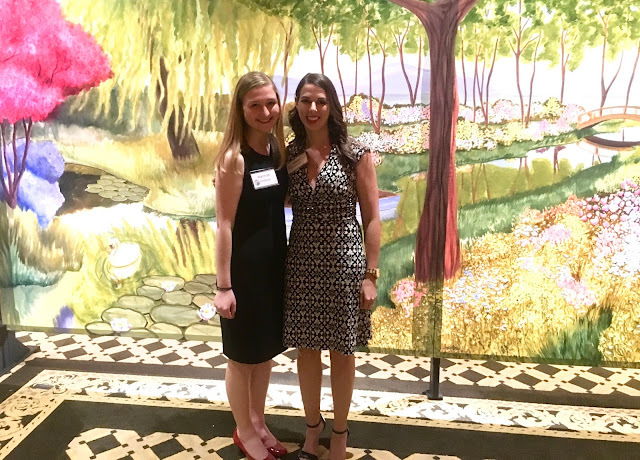 It was completely an honor to be invited to this event and to speak to the importance of teaching the Holocaust to students. I wish I had remembered to talk about how this topic turns my non-readers into readers, my quiet kids into curious questioners, my apathetic kids into people of action. Erin, me, and my principal. It feels so good to always have her support. I spoke for five minutes, but there was so much more I could have said. I wish I could share the importance - the word is just not strong enough, truly - the gravity of teaching the Holocaust with more than just those present that evening, but I feel so lucky that I had the chance to do even that much. And I feel so, so lucky to have the museum nearby so we can continue to work as partners and continue to change lives. I've uploaded my speech (for now at least - I'm not sure how long I'll keep it up) to a page on my blog for those who may be interested. What is a cause you are passionate about?